American DJ Quad Scan Pro DJParts - All Variety of Parts that DJ Needs. Now even brighter! 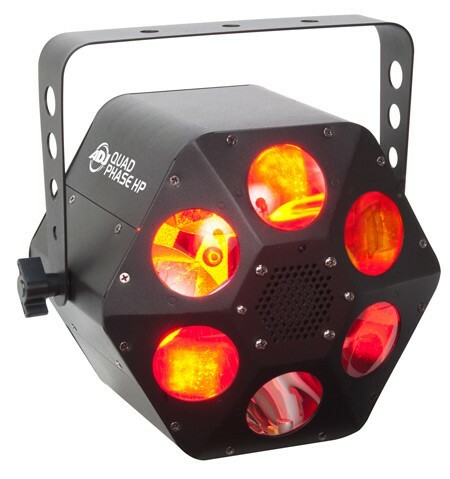 ADJ's Quad Scan Pro is designed to scan the room and dazzle a crowd with its higher output 4x RGBW Quad LEDs. This fixture offers all the latest features sought after in special effects lights such as: DMX-512 for programming or linking capabilities, exciting built-in sound active programs, no duty cycle (run all night), a long life LED source (approximately 50,000 hours), 4-button DMX display on rear (for easier programmability), IEC power daisy-chaining and is compatible with ADJ's UC3 easy-to-use mini controller (Sold Separately). With it’s light-weight and portable case design, the Quad Scan Pro is great for Mobile Entertainers, bands, night clubs, Roller Rinks and Bowling Centers. Features: · 4x 4-in-1 RGBW “QUAD Color” LEDs - produces a variety of color effects · Includes 4 replaceable gobo patterns (Gobo size: 20.5mm; Viewable size: 12mm) · 3 DMX Channel Modes (1, 5 or 32 Channels) · 4-Button menu system LED Display making it easy to navigate · 3 Operational modes: DMX controller, Master/Slave & Sound Active · Exciting built-in lighting programs · Dimming: 0-100% · LED Strobe effect · Single Yoke + safety loop included · Compatible with American DJ UC3 Series easy-to-use controllers (sold Separately) · IEC AC IN/OUT on rear to daisy chain power (up to 4 Quad Scan PRO’s@120V, and 7 Quad Scan PRO’s @ 230V) · Extreme long lifetime of the LED (Rated at approximately 50,000 hr.) · Power consumption: 88W max • LED Source: 4x 10W Quad LED’s • Multi-voltage operation: AC 100V~240V 50/60Hz- IEC socket • Dimensions (LxWxH): 17.25" x 14.25" x 5.25" / 438 x 356 x 133mm • Weight: 17 lbs. / 7.5 kg.